Masters and slaves must be set as groups and each group must be programmed separately. You must perform the following steps in the order listed to correctly program your EcoSMART driver. You may setup a maximum of seven separate groups, each having a unique master pump. 1. Clear Driver Memory - The internal memory of each unit must be cleared before setting up a group. 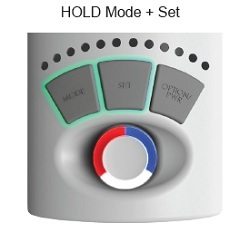 Hold Mode and Set together until the control dial blinks red/white/blue. 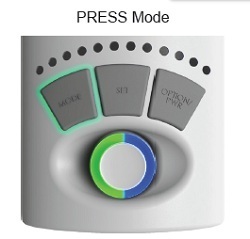 Then hold mode until the dial blinks red/purple. Then hold Set until the pump resets. 2. Enter Setup Mode - All pumps in a group must then be set into configuration mode before the assignment of slave or master status. This configuration must be performed with the drivers in close proximity to ensure proper assignment. Hold Mode and Set together until the drivers blink red/white/blue. 3. Assign the Master - Set the master pump by pressing the mode button. The control dial will then blink blue and green. You are now ready to assign slave pumps. 4. Assign the Slaves - Set the slave pump by pressing the set button on the driver. The control dial will then blink blue and yellow. NOTE: If the slave blinks blue and red, it was too far away from the master driver and could not communicate properly. Repeat this step for all slaves you want to assign to the master. 5. Reset the Master - Hold the mode button on the master pump after completing ALL the master/slave assignments. The pump will reset and begin operation in the previous mode you had programmed. You can then change modes with the master pump like normal and the slave pumps will operate according to what the master pump defines. Slave pump speeds can be defined by the master or can be locally defined, a Local Max Speed to a Slave. 6. Begin Normal Operation - Use the controls on the Master Pump to operate all pumps in the group. 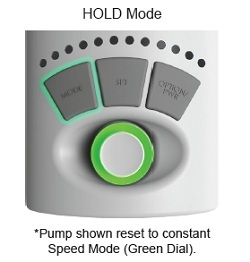 Slave pumps can only be set to sync or anti-sync modes, or the three options in EcoSmart modes. • Program Subsequent Groups - Now that the first group is programmed, repeat these steps on the next group of pumps, if so desired. • Un-assign a Slave Pump - If you would like to un-assign a pump as a slave and use it independently, follow instructions for clearing driver memory and perform those steps on the slave pump which you would like to un-assign. NOTE: The subsequent pump groups must be programmed near the original group. For example, if running two different groups in separate areas of your house, the second group must be programmed within 5 feet of the first group to ensure proper communication.